Fighting forest fires is a demanding but rewarding experience. Only people who believe in teamwork, safety and a dedication for fitness will be considered for positions. Because employees' safety is the utmost concern, intense training programs must be successfully completed prior to applicants' being hired. 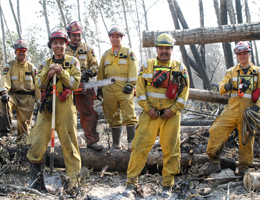 There are several types of wildland firefighting positions, and all interested candidates must successfully pass a medical screening and physical fitness test. The Unit Crew (UNIT) program provides the right individual with a unique opportunity to work as a team member on a 20 person unit crew. It offers the chance to travel and work in different locations and remote areas of the Province, while assisting in preserving Alberta's natural resources. Unit Crews are considered sustained action crews, who are specifically utilized to contain and completely extinguish fires. The position is both physically and mentally challenging, bringing with it a feeling of personal satisfaction and accomplishment. Members must maintain a state of good health and physical fitness to endure the rigorous training and, at times, arduous working conditions. Prior to training camp, all candidates must have, and be able to provide proof of, a valid Standard First Aid certificate with CPR, a driver's license, a defensive driving certificate and a valid high school diploma or equivalent. 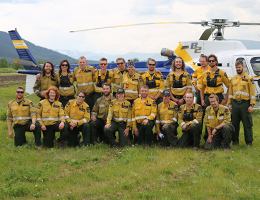 The Helitack (HAC) program provides the right individual with a unique opportunity to work as a team member alongside people with similar interests. It offers the chance to see different and remote areas of the province and to assist in preserving Alberta's natural resources. The position is a challenging one, bringing with it a feeling of personal satisfaction and accomplishment. Members must maintain a state of good health and physical fitness to endure the rigorous training and at times arduous working conditions. The fitness standard reflects the very real dangers that accompany firefighting. On a fire, a high-energy output over extended periods is normal, and good physical conditioning helps mitigate the risk of fatigue related accidents. Prior to training camp, all candidates must have, and be able to show proof of, a valid standard first aid certificate with CPR, a driver's license, a defensive driving certificate, and a valid high school diploma or equivalent. The Helitack-Rappel (RAP) program presents the right individual with a unique opportunity to work as a team member alongside people with similar interests. It offers the chance to see different and remote areas of the province and to assist in preserving Alberta's natural resources. Medium-weight helicopters carry particular weight and safety requirements. For this reason, individuals accepted into the program can weigh no more than 180 pounds (82 kg). Members must maintain a state of good health and physical fitness in order to endure the rigorous training and at times arduous working conditions. The fitness standard reflects the very real dangers that accompany both rappelling and firefighting. On a fire, a high-energy output over extended periods is normal, and good physical conditioning helps mitigate the risk of fatigue-related accidents. 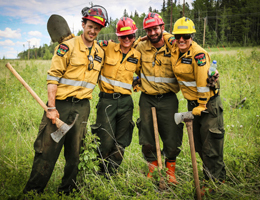 The Firetack (FTAC) Program is a great opportunity for First Nation or Métis firefighters to further their wild land firefighting experience. It offers members the chance to work and see the different areas of the province. Members must always maintain a good state of health and physical fitness to endure the rigorous training, and at times, arduous working conditions. Selection is done by a contractor in consultation with the local communities/settlements. Contact your local Wildfire Management Area Office to receive contact information for local contractors in your area. Contractors will provide their criteria for selecting candidates. Each candidate must go through the medical screening and physical fitness test. How much money will I make per hour? Respective employers determine rates of pay. Who is responsible for training firefighters? The contractor is responsible for the training of all crew members. What type of training is offered? Crew members receive a two-week firefighting course from an approved training institution. Crew leaders and sub-leaders receive an additional 10 days at the Hinton Training Centre. What is the minimum grade required to pass the training? A minimum grade of 65 percent is needed to pass. When is the required training held? Courses are carried out at various times throughout the year. What do I need to bring to the training courses? Members are to bring their own sleeping bag, CSA-approved footwear, rain gear, running shoes, exercise clothing, adequate work clothing and personal items. Gear cannot weigh more than 45 pounds (20.4 kilograms). What do I need to bring on the job? Will my duties only consist of firefighting? Firetack members are to be capable of performing work on other projects. Interested applicants can submit a completed application and resume by mail, email, or fax. Please quote Competition Number RAP, HAC or UNIT. Applications are available online or can be obtained from any provincial government office. Indicate on your application which crew you are applying to. NOTE: We thank all applicants for their interest; however, only individuals selected to proceed to the next hiring stage will be contacted (initially by email and then by phone). Due to the large volume of applicants, we regret that we cannot confirm that our office has received resumes. Applicants who apply online will receive an email acknowledging receipt of their application. If you apply by email, please DO NOT send a duplicate by regular mail. Before any physical fitness testing is conducted, all candidates must complete a Physical Activity Readiness Questionnaire (PAR-Q+) and sign an Informed Consent. Forestry Division reserves the right to request a medical examination based on the information provided in the PAR-Q+. Physical fitness is an integral part of the training, and certain levels of fitness must be maintained throughout the contract period. To ensure minimum fitness levels are being maintained, crews are tested throughout the season. 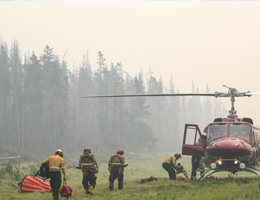 The wildfire crew member training course is held each year at the Hinton Training Centre in Hinton, Alberta. Job offers are extended upon successful completion of the training. Candidates are subjected to stressful conditions with morning fitness classes at 0600 hours each day, seven days a week. There will be occasional evening lectures, written exams on fire theory, practical application and the use of firefighting equipment. The candidate will gain basic knowledge, such as proper care and usage of Personal Protective Equipment (PPE) and helicopter operations. Safety is of the utmost importance. Anyone failing to display a safety-conscious attitude will not be accepted. The training is strenuous, and candidates will be assessed and selected in accordance to the above guidelines and to their suitability for the program. Pending training completion, crew members will report to their respective Wildfire Management Area, where they will live and work together in strategically placed fire bases. During a typical season, members may experience varied periods of fire action, which may include long days of sustained action on larger fire complexes. The remainder may include project work, proficiency training or deployment to other regions to assist with fire suppression. Crews will usually have trailer/bunkhouse accommodations. In some cases, members may be expected to cook for themselves. Members can also be based in tent camps in remote locations and overnight on the fire line for up to 15 days in order to extinguish the fire. This may happen several times throughout a season. Members are expected to supply sleeping bags, rain gear, adequate work clothing, running shoes, exercise clothing and personal items. Also required are chainsaw safety boots that are a minimum of 8” in height with aggressive soles with a lug pattern (ex. Vibram) and provide chainsaw protection for the toe, sole, ankle, and top of your foot (metatarsal). The employment period will vary depending on the location. The approximate period may be from April 1 to October 31 and may be extended depending on the fire danger. Due to the helicopter payload limitations, there may be a weight restriction for individuals accepted into the program. Crews may be required to work a 15-day shift with six days off or a 10-day shift with four days off. Crews will be expected to move and work throughout the province. Due to aircraft transportation limits, members are limited to 65 pounds (30.5 kg) of personal gear. This should consist of work gloves ,work clothing, sleeping bag, rain gear, running shoes, exercise clothing and personal items.